Chicken wings win many people’s hearts. Yet some people might be put off simply because eating wings are troublesome and messy. What if they are single-bone wings? You can easily tackle the worth-dying-for chicken meat on the bone. No more mess at all. 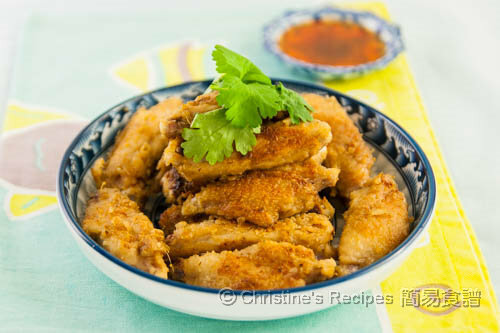 As for cooking, the marinade penetrates single-bone wings more quickly. This time I tried Maggi sauce, a seasoning sauce made by the brand Maggi, just like soy sauce. And I found it went really well with chicken wings. Lemongrass is quite common and often used in Thai cooking. These two ingredients make the wings so tasty with a pleasant lemongrass aroma. This dish is so easy to make. Just mix all ingredients and marinate the wings, then off them into the pan. 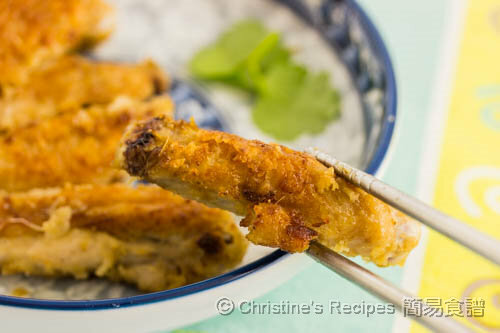 The end result is just like those crispy deep-fried chicken wings. How to produce this effect? All you need is to coat some plain flour/all-purpose flour. It works magically. Sounds attractive? To tell you the truth, I made this dish twice in a row last week. It seemed the wings were not enough every time. Carefully use a sharp knife to cut the joints at both ends of the wings. Cut each wing into two sections. Each with a single bone inside. Cut the lemongrass into smaller-sized pieces. Process in a food processor. Combine the lemongrass and marinade with wings well. Let it marinate for about 30 minutes. Heat oil in a non-stick frying pan over medium heat. Lightly coat each wing section with plain flour. Shake off the excess flour. 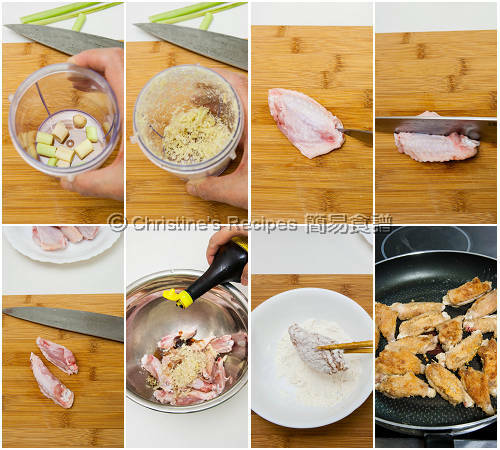 Place the wings in one single layer in the frying pan. Cook until both sides are lightly brown and cooked through. Serve immediately. Dip in Thai sweet chilli sauce if desired. By processing the lemongrass with a food processor, you’ll get the finest texture. The dish is more favourable. If you don’t have a food processor at hand, you may pound the lemongrass with a cleaver knife and chop as finely as you can. 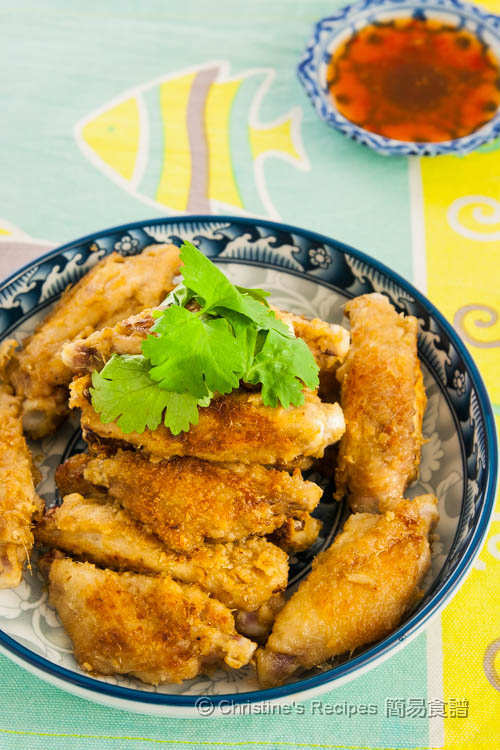 The plain flour with lemongrass coating will give a crispy and crunchy texture after pan frying. It’s awesome. I think chicken wings are the best part of all! These look great, Christine. May I ask what is Maggi sauce? Maggi sauce is a soy sauce actually, the brand called Maggi. I've provided a link in the recipe for browsing the picture. Although Maggi sauce and soy sauce are similar, they're not exactly the same. I checked the ingredients and there is actually no soy in it. Thanks for your feedback. checked the ingredients too. It's not fermented from soy. Many people like this sauce a lot. You might try to make Vietnamese pork chops. The taste will be quite nice. Can i put in the oven, instead of pay fry? Sure, you can use oven to bake them. Can other Brands of soy sauce be used instead of maggi? The maggie sauce has some other seasonings in it. You might use other brand of soy sauce of course if you don't mind missing some flavours.